Energy giant BP was expected to begin a new effort Saturday to contain a Gulf of Mexico oil spill by placing a better cap over the gushing well in hopes to stop the flow of oil completely. However, the operation will require temporary suspension of the current top hat containment system. That means about 15,000 barrels of oil a day that had been collected through the old capping system will spew directly into the Gulf until the new cap is in place. 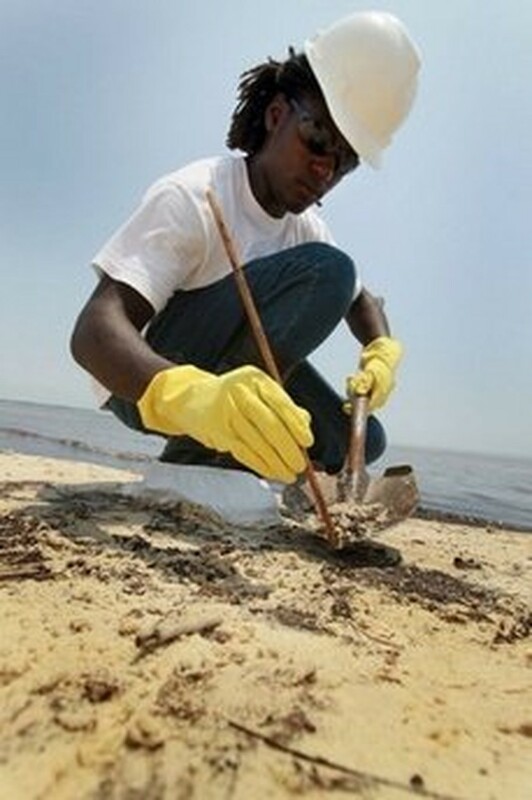 A worker cleans oily globs that washed ashore in Waveland, Mississippi. If successful, the new cap could capture all of the crude spilling into the Gulf and allow it to be siphoned up to container vessels on the surface, in effect halting the devastating spill of crude into the sea that has imperiled fragile coastlines and wildlife across the Gulf Coast. BP said meanwhile in a letter to Allen that it wants to move forward with its plan. Managing Director Bob Dudley said the company wanted to take advantage of forecast good weather to place a more effective cap over the leak and hook up the new containment ship, the Helix Producer. Earlier, Allen said he was optimistic about a fix soon for the environmental disaster.